The most common type has mostly calcium along with oxalate or phosphate. Occasionally, kidney stones do not cause symptoms. They leave the body in the urine. The condition, though, can cause severe pain. 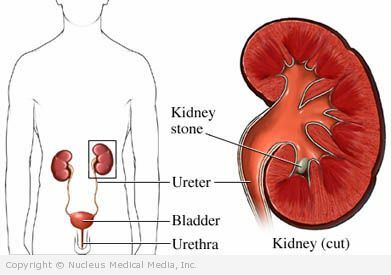 For small kidney stones, drinking at least two or three quarts of water a day helps the body pass the stone in the urine. The doctor may provide a special cup to catch the stone when it passes so it can be analyzed. If you are having a hard time keeping fluids down, you may need to be hospitalized to receive fluids in your vein. Your doctor may recommend that you take pain medication. You may need medication that is given in the vein or in the muscles. Certain medicine used to treat high blood pressure (eg, calcium channel blockers and alpha blockers) may help your body pass kidney stones. If you are diagnosed as having kidney stones, follow your doctor’s instructions.